In summation, this book is misleading. 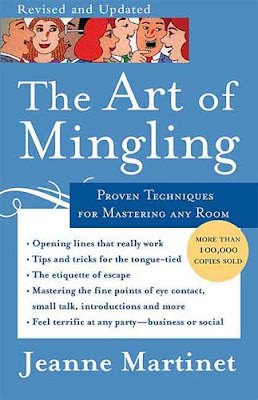 I read it under the assumption that it was geared toward helping people master communication within social settings. I felt that if I could grab some good tidbits from this book I could use them to help me (and you) professionally. However, I would put this book in the same category as a Nora Robert's novel or a Lifetime Original Movie. I don't have any problem with Nora or the Lifetime channel, but both have little to add toward a professional repertoire and neither does this book. The book had two main philosophies I disagree with as a business person: Lying and Flattery. Many parts of the book were written for a female reader, although the author tries (and fails) to make it for both sexes. If I went up into a crowd of people and say "Excuse me, no one had informed me we had become intimate" (and giggle)... I would probably be shunned. Or... "You look bored, so bored you must be smart, are you smart?"... I'm embarrassed for anyone that would say that. Don't buy this book.. I am willing to give away my copy if anyone wants it. And I'll jot a note down to myself, not to trust all the recommendations Amazon.com gives me. If you have any questions on the book don't hesitate to ask. I would be more than happy to help anyone that wants it. I appreciate your honesty about this book. How interesting that this was a recommended read by Amazon.com. That makes me think twice about my recommendations from them as well. Good reminder that we should really research everything ourselves, not just do something or read something just because it came recommended by someone or something that we like or find useful. Glad I came across your blog from reading a U.S. News & World Report article online! The article was "10 Personal Finance Tools You Should Use Now," by Kimberly Palmer. Thank you for your comment and your readership. Let me know if there is anything I can help you with along the way!